As a young kid, Michael Myers (Daeg Faerch) lives a terrible life with his awful redneck family. Even at 10, he’s a little strange. He brutally kills a bully, and then turns on his family in short order, leaving only his mother alive. He’s institutionalized under the care of Dr. Loomis (Malcom McDowell). Michael (Tyler Mane) grows up into an imposing monster of a man. Eventually Loomis gives up, after a series of deaths and Michael is to be taken to maximum security prison. Of course, Michael escapes, grabs a knife and heads to Haddonfield, Illinois. He has one family member left to deal with. A lot has been written about this movie, but I think separated from the baggage of being a remake it is a pretty solid slasher. It is a superbly crafted film; Zombie definitely has an eye for composition and use of color. I think the first part works far better than the second, where the movie begins needlessly copying scenes from the original. The movie looks like it is taking off on its own trajectory and then turns around and reminds you it is a remake. 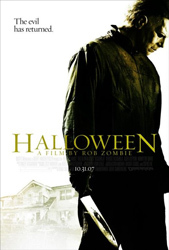 Horror fans are fickle, they complain when a remake deviates from the original too much (the 1st half of the film) and when it copies the original too closely (the 2nd half of the film), so this ‘Halloween’ had a target on its back from the get go.